With a mission to create India’s most respected chain of Pharmacies & wellness stores, Wellness Forever with 45+ stores across Mumbai and Pune is committed towards round-the-clock availability of medicines, community pharmacies and a smile for all. In expanding business scenario, connecting new store locations with central office for inter store calling and data sharing was the biggest challenge for IT administrators. Wellness Forever is strongly dependent on robust IT and communication systems that run 24/7 in order to fulfill its social promises. All the stores must remain connected with each other for voice communications, sale & inventory data exchange and surveillance of store locations with centralized administration. In expanding business scenario, connecting new store locations with central office for inter-store calling and data sharing was the biggest challenge for IT administrators. Centralized monitoring with remote access to store’s video surveillance systems was another area concern. At the same time stores required IP-PBX for in-store communications, capable of providing cost-effective PSTN and GSM trunk dialing and Site-to-Site IP telephony. Admin executives and IT staff required mobile extension solution for such dynamic workplaces. Wellness Forever’s IT managers were in dilemma as how to streamline different functions working in silos. Matrix working with Digitek Solutions clearly understood the requirements of Wellness Forever and delivered single box solution - NAVAN CNX200. It is a converged voice & data platform that addressed all voice telephony, high-speed internet, wireless access, data routing and multi-store networking requirements of Wellness Forever. Connected other stores with toll-free IP telephony and reduced telecom costs For each call placed between store locations, Wellness Forever saves telecom costs by surpassing toll charges. IP telephony feature of NAVAN provides simple 3-digit dialing, call transfer, conference and other call management features for inter-store communications. 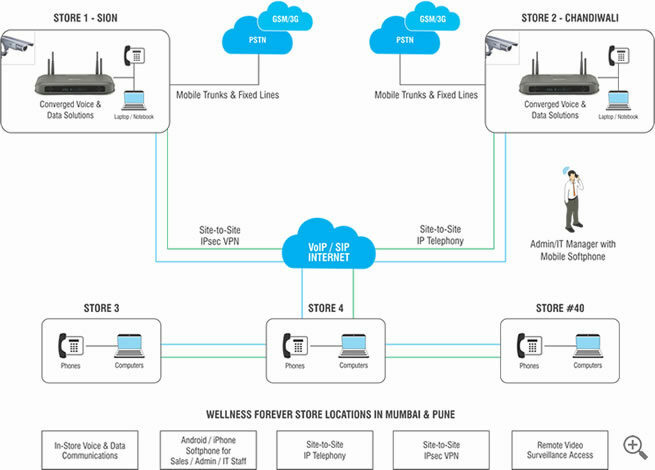 Networked store locations with site-to-site IPsec VPN Other locations with legacy VPN and firewall systems were connected with IPsec VPN. This in turn facilitated information sharing between supermarket retail stores, resulting in better management for inventory, sales and patient database. Delivered on-the-move mobility for Admin and IT staff Innovative SPARS MS – Mobile Softphone application enabled all IT and Admin staff to carry office extension wherever they go. They can reach each other by simply dialing an extension number or browsing through corporate directory. Enhanced collaboration with video calling, instant messaging and presence sharing, voice mail features. Enhanced security with centralized monitoring of surveillance systems Advance data routing features of NAVAN helped administrators to centrally connect and view surveillance systems of supermarkets ensuring safety measures for all.